First, let me say that I have been associated with ECN for about 3 years and have always enjoyed being involved as the person responsible for post these pictures in the forum. They are from the field and many are sent to me either here or to my email address. I also received many from readers of EC&M. I will continue and want to thank Bill for this opportunity. Now, let's discuss the following. Should there have been more replacements of equipment here? See any other items? How about 300-4(f)? Ungrounded No 4 and larger conductors enter a box, ... they shall be protected by a insulated fitting. Also, the area around the lugs looks pretty cooked. 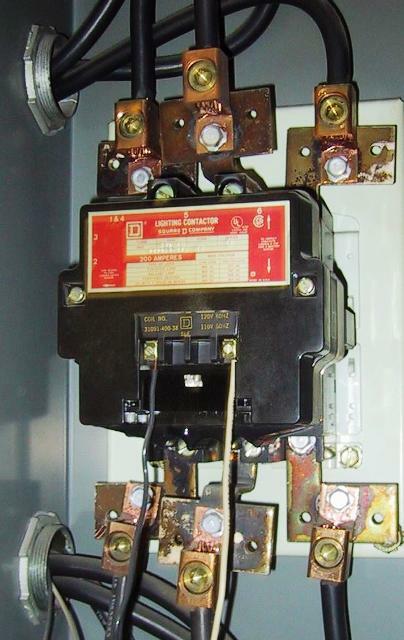 Judging by the age of that contactor, maybe it's just from continuous loading ovewr the years? I'd put some KopperKote on them if replacement wasn't an option. How about 200-6 Identifying the grounded conductor...continuous white or gray outer finish or 3 continuous white stripes? I don't like the 1 Hole lugs. They look as though they could contact another phase if you were doing a PM or service because there are no dividers. At the lower right, there looks to be a mounting screw and nut behind the lower right lug. Looks like it wouldn't take much movement for the lug to short against the screw/nut. Was there some sort of block of insulation that should be used to hold the lugs more securely? I see small holes in the lugs that might have had small screws into such a block of insulation. Can anyone date the work? I figure mid-late sixties... The work itself isn't bad, clean but old. I'm not sure if bushings were even required then? Didn't they make them out of lead at the time? And didn't they just realize lead caused brain damage? Speaking of metals, the lugs look to be mounted on copper clad, or other wise coated aluminum, with some sort of tin bolt covers. The lugs look copper, but with brass set-screws. Whole lotta dis-simular metals going on from the manufacturer. Maybe this was in the height of fear over use of aluminum. Other than the bushings, I dont see anything wrong with the workmanship, just equipment failure. 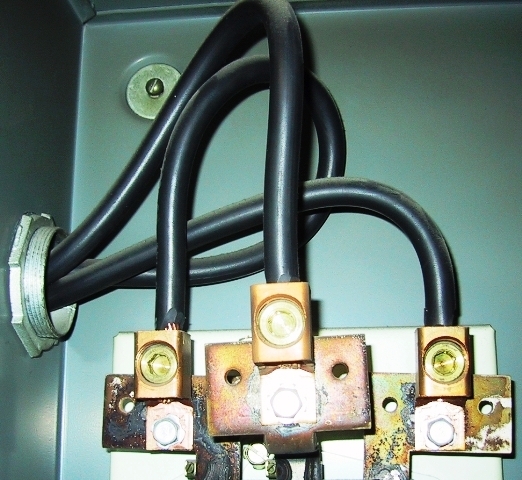 If this is a 3 phase contactor, the only neutral there on the coil is id'ed. I see heat damage to two of the lug mounts....could just be soot from cooked insulation, but I doubt it. Assuming heat damage, this could be the result of some sustained sinfle-phase operation. I'd feel better if the starter were replaced. After staring at this...Trying to come up with something I found a solution to saving the contactor. 1. Remove the the buss extensions. 2. Land the 1 hole lugs directly to the contactor. This would fix any clearance issues with live an grounded parts. Like where Phase's A & C are so close to the back plate bolts. A sheet of phenolic between the back plate & contactor would be nice.